Janmastami 2018! All the Information You Need! ~ The Toronto Hare Krishna Temple! Janmastami 2018! All the Information You Need! Just over a week after we celebrate the appearance day of Lord Balarama, we celebrate our biggest and grandest celebration at the temple, Krishna Janmastami, the appearance day of Lord Krishna. This year Janmastami falls on Monday, September 3rd. However, we will be celebrating Krishna Janmastami on Sunday, September 2nd and on September 3rd! Krishna appeared over five thousand years ago in Mathura. His name means the all attractive one. 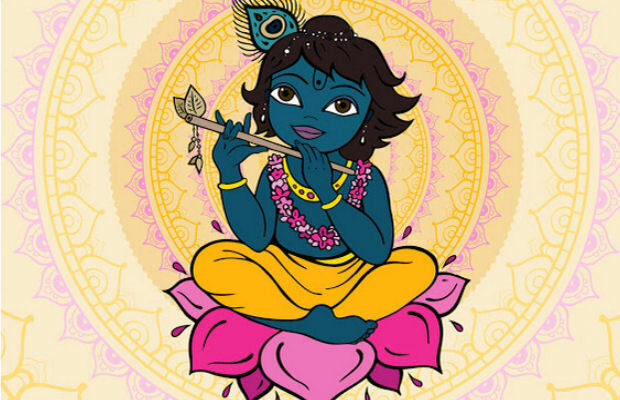 He is transcendental, all-knowing and possesses all the qualities of all the avatars yet He remains as an ever-youthful cowherd boy. His beauty and sweetness know no bounds. Lord Krishna is the spiritual master and friend to all. To set the mood for this most auspicious day we will have two 6 hour kirtans on Sunday and Monday starting at 12:30pm. The temple will be buzzing with activity on Janmastami day starting at 4:30am with Mangala arati. The main festivities will start at 6pm and go until midnight. The evening will be filled with kirtan, bhajans, discourses, dances and an abhishek (bathing ceremony). The highlight is of course the countdown to midnight. A special arati will be performed to their Lordships Sri Sri Radha Ksira-Chora Gopinatha who will be dressed in an exquisite flower outfit! We are pleased to announce that world-renowned kirtaneer Amala Kirtan prabhu will be attending our Janmastami celebrations. You can be sure to expect the temple room to be filled with lively energetic kirtan! We have found some nearby overnight parking options for your convenience. These parking lots are about 10 minutes walking distance from the temple. 12:00am - 12:30am: Midnight Arati with Special Flower Darshan! Please join us with your whole family on this very special occasion!